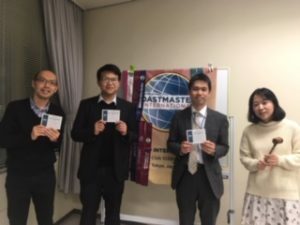 Toastmasters of the evening was TM R.T.
She perfectly led the whole meeting on time. CC manual#8 The title was “Modeler’s Community“. He talked about his hobby — making plastic models. He upload his works on SNS website of modelers. Viewers could leave their comment aor evaluations for it, which motivate him. He’s getting loads of comment on his works. When he was student, he worked at a part time job as a cook. He introduced us how to cook the perfect fried rice! Evaluator for TM H.Y. was TM M.O. She pointed out some good point, such as his organization of speech, and visual aids, and advised he could talk about his future plan. Evaluator for TM N.K. was TM K.M. He praised TM N.K.’s great speech topic, construction and body language. One suggestion was that he could change tone and volume of his voice so that he could express his passion and humor more effectively. Table Topic session was held by TM A.T.
TM D.N. answered that he studied Julius Caesar, so he would like go back to Ancient Rome and attend war! Are you a dog person, or cat person? Today’s Guest K answered this question. He likes dog because its royal and always shows genuine love to us. He wanted to be a person like that.